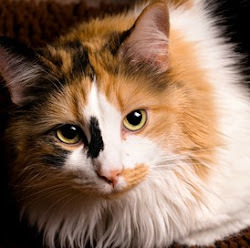 Thomasina's Purrls Of Wisdom About Cats: Why Do Cats Put Their Toys In Shoes? Why Do Cats Put Their Toys In Shoes? Why does my cat put toys in shoes? Isn't that sort of weird? To be honest, I put toys in shoes all the time so I know where to find them. She has these ugly red ones that she never wears, and that's where I keep my tiny toy mice. Maybe your cat's just being organized like I am. But instinct enters into this, too, because we're all hunters at heart, and for us, toys are almost like the tiny animals we catch outside. When we catch something outside, we might take it to a safe place where we can eat in peace or save it for later. Inside, what hiding place could be safer than your shoe! 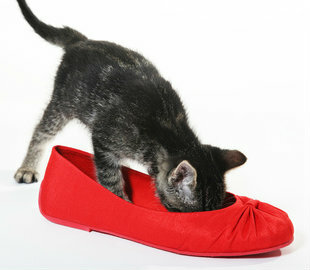 There's another reason why some cats put toys in shoes, too. When we have kittens, we bring them mice to teach them to hunt and so they'll have something to eat. Your cat knows you're not a kitten! But instinct might be telling her to bring you what she caught and put it in a place where you're sure to find it. Oh, and here's a third reason. When kittens start to wander away, their mother gathers them up and returns them to their family nest. So your cat might be collecting her "babies" and taking them to their nest in your shoe. Some human experts say that's why some cats put toys in their food and water bowls. But that makes no sense to me. Why would I want to put my kittens, not that I ever had any, in a bowl of water?? If my toys ever ended up in a water bowl, it would be because I took aim, gave them a good swat, and that's where they landed. Now that I think about it, that really sounds like fun. I hope I've answered your question, because I need to go now. Those tiny mice in our human's shoe want to go for a swim. I just hope no one needs a drink while I'm shooting teeny toys into our fountain. 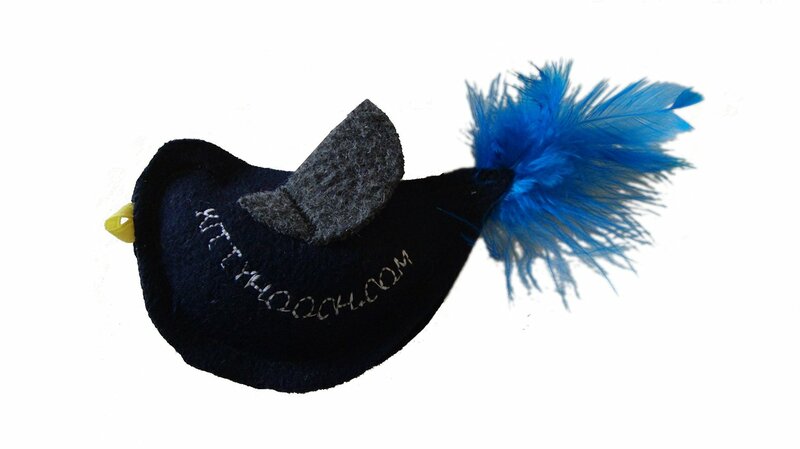 this Kitty Hooch bird in your shoe?